KIKO'S HOUSE: The Old Guys Need To Go Away. May The Best Woman Be The Next President. The Old Guys Need To Go Away. May The Best Woman Be The Next President. While my first and foremost wish is that Donald Trump go away, the runners-up are Bernie Sanders and Joe Biden, who need to get sucked up in his wake. Because if there ever was a time for the Democratic Party to throw out the old and turn to the new, 2020 is it. Did I mention that fresh face almost certainly should be a woman and, in any event, have populist chops? It pains me to write this post. The 2020 ratfuck will be my unlucky 13th presidential campaign as a reporter, editor and blogger, so I have a semblance of experience even if I did get the result of the 2016 smackdown horribly wrong. Oh, and the entire business of who should face off against the Republican nominee, who almost certainly will not be Trump because his cluelessness and corruption finally is catching up to him, is starting way too early. I like Sanders, but he's so yesterday despite having decent liberal-socialist policy chops. I love Biden, but the time has long passed when we want to vote for a guy because he would be great to have a beer with. Besides which, neither could win the nomination when they had a decent shot at it, in Biden's case several shots, so why would they secure the nomination, let alone be competitive, in 2020? The American populist tradition dates back to Robert LaFollette and William Jennings Bryant, and to an extent Teddy Roosevelt, as well. But the case for a populist Democratic nominee and not an Old School retread in 2020 should be linked to a seminal but underappreciated event -- the takeover of Zuccotti Park in Lower Manhattan by Occupy Wall Street protesters in September 2011. The two-part message of these protesters, which predictably became muddled by the news media, was a clarion-call clear: The brigands who nearly collapsed the U.S. and global economies in 2008 had never been called to account and were going to do it all over again, which they of course are well on their way to doing in their methodical looting of Main Street with the glowering approval of the man with the small hands and peculiar hair. The fragile seed that sprouted from Occupy Wall Street has grown into a new populist wave. Obamacare, flawed as it is, was an early result of that wave. So were the Dodd-Frank financial reform measures and Sanders' 2016 challenge to Hillary Clinton, a centrist whom Sanders effectively pushed to the left. The signal effort of the Republican Party since Occupy has been to try to stop that wave by undermining Obamacare, neutering D0dd-Frank, handing the super rich and corporations massive tax cuts and doing whatever else it could with its congressional majorities and the greedy dunce in the Offal Office to widen the already huge gap between the haves and have nots. This has included nominating and approving judges who will do the fat cats' bidding when the populists get uppity and blaming the Bush Recession on poor people. Which brings us to the Blue Wave victories of Democrats in November, many of them women and most of them populists, and now the quadrennial ritual of turning the lights back on at the sausage factory known as the presidential nominating process. 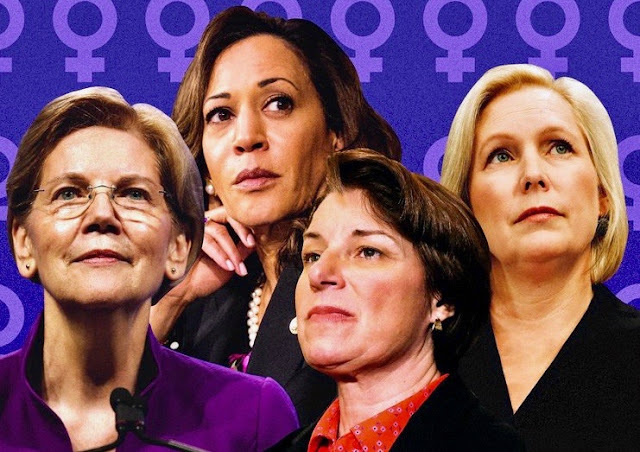 One thing that the potential nominees to whom I am attracted -- Elizabeth Warren, Kamala Harris, Amy Klobuchar and Kirsten Gillibrand -- have in common is their support for a progressive income tax and its iterations, including a "wealth tax" of 2 percent on assets exceeding 50 million being pushed by Warren. Granted that $50 million isn't what it used to be, but I probably would be able to scrape by on it. It's easy to get caught up in labels, but you can't get more egalitarian -- which is to say populist -- than a progressive income tax if you agree with my definition that a populist is a politician who, for the moral and societal good, strives to appeal to ordinary people who feel that their concerns are disregarded by the elites. What better example of those elites than the chorus of Trump administration Marie Antoinettes during the recent 35-day government shutdown. My fave: Kevin Hassett, chairman of the White House Council of Economic Advisers, saying that the 800,000 workers furloughed during the shutdown were "better off" since they could go on vacation without having to use their vacation days. This appalling tone deafness, coupled with the GOP's relentless efforts to undermine anything that is good for Main Street because it might be bad for Wall Street, is a once-in-a-generation opportunity for the Democratic Party. Why do I prefer a woman nominee? Hillary Clinton. While there are many explanations for her loss to an unqualified crook, including her campaign's mistakes, Russian hacking and James Comey's piss-poor investigation of her email server, sexism clearly played a role and it's time that we exorcise that demon. Misogynistic voters aren't going to retreat to their man caves in 2020, but at the rate Trump and Republicans are destroying the country, enough Americans may be willing to let a woman try to save it. It can't be just any woman. They have different abilities and personalities just as the men do. Kamala Harris is the only one I would look at right now. They are making Warren look a bit like Hillary, not at all herself. I think she serves us better right where she is. Gillibrand threw Hillary under the bus and has done the same with some of her fellow Democrats. I cannot recall the specifics - chalk that up to be over the hill. Although I like Klobuchar she does not seem forceful enough so I would leave her where she is to serve us from that vantage point. So is Joni Ernst the only Republican female? They're giving her a lot of photo ops now. Her ex got their Iowa residence in the divorce and she the one in Washington. Maybe she doesn't even represent Iowa anymore - if she ever did. Aren't there a couple of young men in the race on the Democratic side? You know what they say, a woman will have to work twice as hard to get elected. Couldn't agree more about Sanders and Biden. More younger people in every branch (well, maybe not the Supreme Court, at least until we get a Democrat in the White House and get rid of Mitchy et al in the Senate). As much as I like Elizabeth Warren, I have to agree that her strengths might be more valuable in the legislative branch, although I am not completely convinced of that. She's a straight talker who connects with people and presents clear arguments. And NO NO NO to Gillibrand. NO. Also agree that Kamala Harris is a strong, smart contender. My only worry is her limited Congressional experience but apparently experience isn't everything, e.g., Hillary. I don't know enough about Klobuchar except what I saw in the Kavanaugh hearings; impressive. Someone with a calm demeanor would be refreshing. Cory Booker is also running, but I do admit to worrying about his coziness with the pharmaceutical industry. As for Joni: yikes! Well, what can I say? I've only voted for one Republican in a national election (Wayne Gilchrist), so I can only give my gut opinion about the former pig castrator: really scary. It cannot be emphasized enough that this circus is starting way too early, every candidate has flaws, shortcomings and sometimes skeletons, and my preference for a woman aside, there are solid male candidates starting with Corey Booker. You are correct that a woman will have to work twice as hard. I am not so naive to think that a President Klobuchar or Harris would change that, but it sure would be a start. As a fellow MD-01, I respected Gilchrist but he was a bog-standard Reagan R so I always voted for the Dem. I was no great fan of Kratovil but he was light years better than the odious Andy Harris. You're right about the early start and crowded field for 2020. We will know the End Times have arrived when Martin O'Malley returns to challenge Schultz as the technocratic centrist the nation the is yearning for /s. I'm still on board for a Klobuchar/Harris ticket. I like Warren's tax views but thought the DNA move signaled she may be politically tone deaf in a national campaign and thus vulnerable. There's something about Gillibrand I don't like; I'm not convinced she possesses a sense of humor. Bernie is still the best. While he is certainly old, he is actually the most skilled politician in the pack (except for Biden), in addition to being a principled democratic socialist. While he is certainly male and pale, he surrounds himself with strong advocates of every "identity" while eschewing identity politics in favor of class solidarity. He can work across the aisle about as much as anyone can in this age of hyper-partisanship. He has none of the baggage of corporate toadying, including toadying to the school privatizers and prison-industrial complex like some others. A veteran of an Israeli Kibbutz, he can dismantle the logjam assembled by Netanyahu and his U. S. enablers across the political spectrum and work for peace and justice in the Middle East. My late father was a very conservative Navy veteran, but the letter from Bernie (then chair of Veterans Affairs) on his 99th birthday, pleased him immensely. I hope we won't have to simply vote strategically for one war criminal over another in 2020. Admittedly Gilchrist seemed to try to be what Republicans needed, which is why I only voted for him once. I always liked that he stood for the Bay. And I absolutely agree about Andy Harris. How does he stay in there? Jesse Colvin was a nice guy but needed more of a message than he was a retired Ranger. In Kent County, we went for Colvin. I'm open to any viable Democrat at this point. Top concern: can she/he beat the Orange Dunce. So for strategic reasons, I'd prefer someone who could not be easily caricatured as way out of the mainstream. And I too hope it will end up being a woman. But I'm also fine with males, from Biden to Booker. What I want most is a winner. I suggest that the main problem here is that men think with the small head . . . . I heard something else on Corey Booker's record that bothered me, but can't recall it right now. It made me say an immediate NO so it was a biggie. I'll let you know if I remember. We really have had enough of the old guys. If I have trouble remembering at times I do not need a president who does the same. I always wondered why Bernie's significant other doesn't run, she's pulling the strings anyway.Doris Kearns Goodwin believes it will be a young, unknown out there who has been doing good out in a state somewhere out there. I wondered if Castro fits this bill. Have yet to hear much from him. I keep saying we're just too nice on the Democratic side to get in the mud with the Republicans. Maybe it's our Achilles heel.